of Wolfe and other Rebels. Ryan Greene's Take: UNLV's all-time leader in catches and receiving yards is sure to finish his collegiate career as one of the Mountain West's most-decorated receivers of all-time. Wolfe's 88 catches and 1,040 yards were both team-highs in 2008, and if they were kept as a stat, he surely would have led the team in spectacular grabs, as he had a knack for making the big play in traffic over the middle. A near lock to be a future pro, Wolfe could catch upward of 100 passes as a senior. UNLV: The first-ever two-time first team all-conference receiver in school history returns as a senior All-America candidate in 2009 ... A strong, tough, durable and savvy receiver who is an excellent route runner and has a knack for making the big play ... 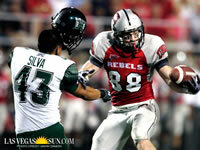 Already holds the UNLV career records with 209 receptions and 2,735 receiving yards ... Heads into the fall as college football's second-leading active career receiver behind only Bryan Anderson of Central Michigan, who has 17 more grabs but has played in four more games than Wolfe ... A unanimous choice for preseason First Team All-MWC by Lindy's, Sporting News, Athlon and Phil Steele's ... Listed as the Most Dangerous Deep Threat in the MWC by Lindy's, which slotted him No. 19 in the nation among receivers ... Sporting News listed him as having the Best Instincts in the MWC ... Ranks fifth in MWC history for yards and is exactly 900 away from breaking league's all-time record of 3,634 set by CSU's David Anderson in 2002-05 ... Wolfe also needs 54 catches as a senior to pass SDSU WR J.R. Tolver's career record of 262 catches (1999-2002) ... His 10 career 100-yard receiving games are also a Rebel record and rank fourth in MWC history ... Has hit double figures in catches in a game four times, which is two more than any other Rebel in history ... Sits second on the school's career list for receptions per game at 5.8 ... A team leader who is a member of the 2009 Rebel Leadership Committee and was voted winner of UNLV's Bill "Wildcat" Morris Most Inspirational Award last season ... A top student who earned a spot on the Dean's Honor List last fall and this spring ... Also took home Academic All-MWC honors in 2008 ... Went through graduation ceremonies in May after earning his bachelor's degree in kinesiological sciences and is currently pursuing a master's degree in sports education leadership. 2008: A First Team All-MWC selection for the second time in three years ... Set career highs with 88 receptions for 1,040 yards and six TDs ... His 88 catches tied the single-season UNLV mark ... Was second in the MWC and tied for ninth in the nation with 7.33 receptions per game ... Also finished fifth on team with 91 rushing yards on 14 carries, including one TD on the ground ... Also a fine special teams player who totaled seven tackles and even lined up in a prevent defensive formation and was credited with a pass breakup ... His 86.7 receiving yards per game was also second in the league and ranked 21st in the country ... Matched his season TD total from 2007 in the season opener, making two TD catches against Utah State ... Finished with game highs of seven receptions for 103 yards ... Hauled in 10 receptions at Utah ... Continued strong start to season with eight receptions for 79 yards at then-No. 13 Arizona State ... Set a season high with 167 receiving yards on eight receptions against UNR, including a seven-yard TD ... Had eight catches for 78 yards against Air Force ... Had 10 catches for 136 yards and a TD at BYU ... Caught seven passes for 100 yards against New Mexico ... Ended the year by making a season-high 11 catches for 144 yards and two scores at SDSU. 2007: Began his sophomore season on the official Biletnikoff Watch List ... Finished with 66 receptions that went for 784 yards ... Was third in the MWC (T47th in the nation) in receptions and fifth in receiving yards ... Made seven receptions against Hawaii ... Hauled in seven balls for 92 yards and a TD at UNR ... Set a then-career-high with 10 receptions that went for 164 yards at Air Force ... Followed that with a career-high 11 receptions for 135 yards and a TD against CSU ... Added 103 yards rushing, making him the team's fourth-leading rusher ... Earned honorable mention All-MWC. 2006: The MWC Freshman of the Year and a first team All-MWC selection ... Led the MWC and was 26th in the country in receiving yards per game (75.9) ... Also was seventh in the league in receptions per game ... Became the first freshman in the history of the MWC to lead the league in receiving yards with 911 ... Set the Rebel freshman record for receiving yards in a game (176) and the UNLV and MWC freshman single-season receiving yards mark (911 yards) ... Started all 12 games for the Rebels ... Racked up 160 yards, including a 71-yard TD reception against Idaho State in the opener ... The 160 yards set a school freshman record, which he would later break ... Had nine receptions for a career-high 176 yards and two scores against New Mexico ... Also hauled in a two TD passes against the Lobos, with one going for a career-long of 75 ... Led the team with five TD receptions. HIGH SCHOOL: A 2005 graduate of Hart HS in Newhall, CA ... A prolific pass-catcher and runner for the powerful prep program ... Earned 2004 PrepStar All-West Region honors ... Led the Foothills League in receiving with 93 catches and 1,268 yards with eight touchdowns ... His 93 receptions in 2004 set a program record ... Averaged 105.7 yards per game with a long of 57 ... Earned first team all-state honors as a WR under coach Mike Herrington ... Also a threat carrying the ball, with six 100-yard games as a senior ... Did not need many carries to eclipse the 100-yard mark, gaining 118 yards on eight attempts vs. Moorpark HS, 112 yards on 10 carries against St. Bonaventure, 160 yards on 13 carries against Birmingham, 136 yards on nine carries against Saugus, 152 yards on eight carries against Burbank and 112 yards on eight carries against Mission Viejo ... Played linebacker as well, finishing with 29 solo tackles and 56 assists for 85 total tackles, five sacks and three interceptions in his final season ... First team All-San Fernando Valley at linebacker ... Selected to play in the 54th annual Shrine Classic all-star football game ... Also lettered in basketball. PERSONAL: Ryan D. Wolfe was born on Nov. 23, 1986 ... The son of Jeri and Michelle Wolfe ... Has a sister, Stephanie ... Pursuing a master's degree in sports education leadership.